Have you seen this statue? What about all dressed up? 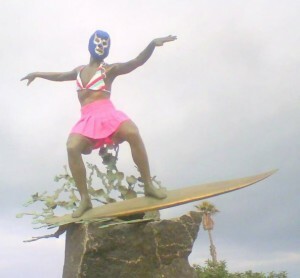 Officially it’s called “Magic Carpet Ride”, however to locals it is commonly known as the “Cardiff Kook.” Good natured pranksters have dressed him up in a bikini top and pink skirt with a Lucha Libre mask or more recently as Cupid for Valentine’s Day. 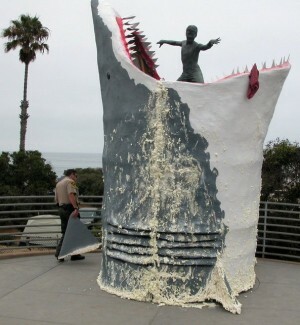 The most memorable one for me is when the statue was enveloped by a papier-mache shark this past July. 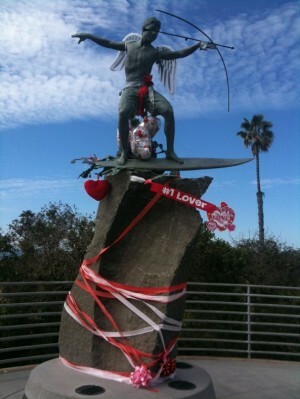 Next time you’re in San Diego, be sure to drive by… you never know what he might be wearing! 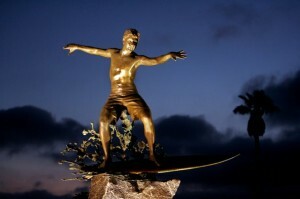 This entry was posted in Attractions, Outdoor Adventures and tagged Cardiff Kook, encinitas, Magic Carpet Ride, north county, statue, surf by Suzzanne. Bookmark the permalink.